Whether you’ve made a resolution to lose weight, get healthier, fitter, or just feel better overall, there’s no better time to start than today. We know that sometimes your brain and your body need a little extra help to get you there. Flora is here to help you reach your goals. Our fermented Green Blend / Beyond Greens, perfect for helping fulfil that healthier diet resolution by easily adding another serving of veggies, our products are here to help you be your best self. Sometimes resolving to incorporate a seemingly small change into your routine can have a huge impact on your body. A simple serving of Udo’s Oil Blend Omega 3+6+9 helps improve brain function, supports bone health, and reduces inflammation. Switching out sugary snacks for a pack of fruit, antioxidant-rich berries cuts calories and leave your body energized and happy. The same thing goes for switching out that daily soda for organic green tea or fresh filtered water with slice of lemon or orange. Whether your change is big or small, taking your health and wellbeing into your own hands is one of the biggest and most important things that you can do for yourself. And Flora’s here to make sure you’re as successful as you can be. When you feel it’s time for a change, there’s sometimes the mentality to “go big or go home.” While that’s great in theory, resolutions to make large changes to lifestyle, diet, or fitness out of the blue often set you up for failure as they are too difficult to execute over the long term. Since your body is an interconnected machine, making a few small changes can radically change how you look and feel. Instead of the big resolutions all at once, set yourself up for success and try our easy tips for making little changes. As humans, we’re nearly 60% water. That means, hydration is key to helping everything, from your organs functioning optimally, to your skin looking youthful, and even decreasing your appetite. Not a fan of the plain water? Give Flora line of teas a try to keep things interesting and keep you hydrated. Omega -3, -6, and – 9 oils like Udo’s Oil Blend help give your brain the healthy fats it needs to keep your cognitive function at its best while promoting muscle development and decreasing inflammation. Mix some into your morning smoothie or drizzle some over a salad. It’s as simple as that. Staring at a computer, iPod, or phone screen before bed has been proven to mess with your body’s ability to fall asleep and catch your much needed sleep. Keep screen exposure to a minimum one hour before you fall asleep for a more rested you. Can’t cut it out? Try for 15 minutes before and add some of Flora Sleep-Essence to your regimen. You’ll be counting sheep before you know it. Whether you’re waking up early to get kids ready for school or working long days, it’s hard to make time to exercise. But experts say that even just 15 minutes a day of cardio is better than nothing. On those days when you feel too tired, remember even a quick 15 minutes is better than nothing—both for your body and for your mental well-being. You’ll feel much better than if you didn’t. Say no to sugar or carbs-filled snacks that do little more than spike your blood sugar and make you hungry again before the hour is out. Go for something healthy like fresh or dried fruit, mixed nuts, full of antioxidants and vitamins. Whether you’re going for weight loss or you just want your body working optimally this year, there’s no doubt that the right breakfast plays a big part in your overall health. Healthy fats and proteins (like eggs!) are key. Make sure you’re getting the right amount of vitamins and minerals by adding a dose of health to your morning smoothie or granola/porridge oats. Looking for a dose of greens? 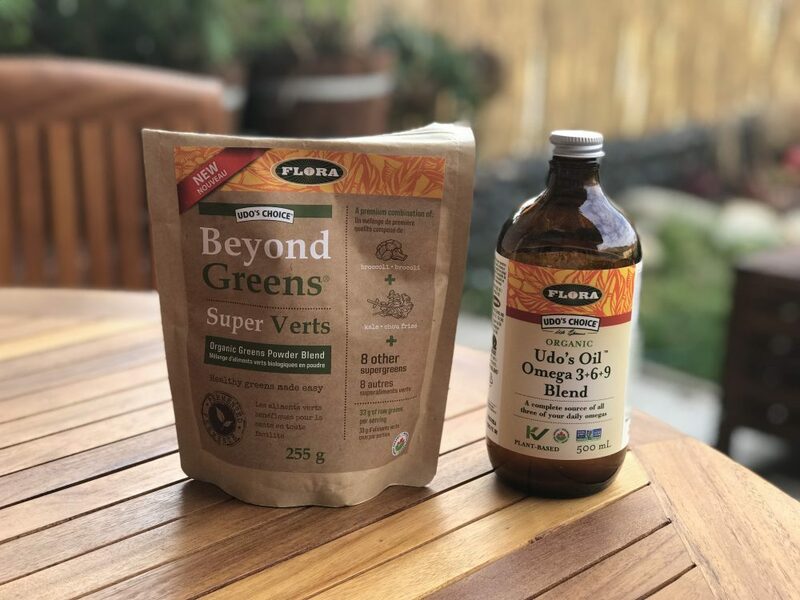 Look no further than Flora’s Green Blend / Beyond Greens which contains fermented cereal grasses for better nutrient absorption.